Metal God Rob Halford is perhaps best known for his unique screeching falsetto that helped put Judas Priest on the map as one of the greatest metal bands of all time. Albums such as British Steel, Hell Bent For Leather, Screaming For Vengeance and Defenders of The Faith still stand as some of the greatest metal albums in history. Although some may argue, it was Halford, the leather clad stage warrior, who carried that band and was Judas Priest’s poster boy for nearly 20 years serving as the vocalist, songwriter, front man, and the crowd drawer. It was Halford’s band, but that wouldn’t stop him from leaving Judas Priest in 1991 in a pursuit for something fresh and new. Halford went on with a string of solo projects. His first solo effort was for the Buffy The Vampire Slayer Soundtrack with the song titled, "Light Comes Out Of Black," in 1992; the following year, he formed the band Fight, which took a similar musical course to Priest, without enjoying their level of commercial success. He then dipped his vocal skills into the industrial/experimental band, Two, whose album Voyeurs was produced by industrial genius, Trent Reznor. Needless to say, the album didn’t go anywhere, and Halford as well as his fans craved the style of old. In 2000, Halford stopped experimenting and went back to his metal roots. He formed the band simply titled Halford, and with his unique screeching falsetto accompanied by two intense double lead guitar masters (Patrick Lachman & Ray Chlasciak) he touched once again on the sound that originally made him a legend in the first place. Halford’s first album, Resurrection was a critical success that was hailed as “The greatest album Judas Priest never made.” The fans loved it, too… In fact Halford’s world tour was such a success that it generated last year’s double “Live Insurrection” set which, amongst many other highlights, includes a one-time only duet version of "The One You Love To Hate" from London’s LA2, that features Bruce Dickinson from Iron Maiden. The Crucible, Halford’s sophomore effort off Metal Is/Sanctuary Records, due for release on June 24th; is a super tight follow-up that has all of the classic Halford you can ask for. Songs like “Wrath of God;” “Heretic;” “Betrayal;” and “Crucible” are hard hitting power metal that will have your skull wailing through the sheet rock. Other tunes, such as “Sun;” “Weaving Sorrow” and “She” demonstrate a much more mellow, deeper side of Halford that shows his evolution as an artist and performer and his maturity as a human being. 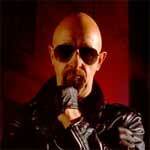 So, while others may try a replicate, there is only one Rob Halford and he is our Metal God. I spoke with Halford recently and we chatted about the new album, some of his new tunes and of course the possibility of a Judas Priest reunion. KNAC.COM: You’ve been rocking for 30 years; you’ve earned the title of ‘Metal God’ and ‘Living Legend.’ How do you handle this place you’ve made for yourself in the metal world? 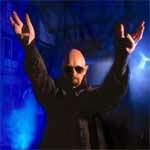 ROB HALFORD: Well, that’s just a fantastic thing to be called and there is only one ‘Metal God’ and that’s me and it’s juts a wonderful accolade that’s bestowed upon me by the fans that have supported me for all of my great years as a metal singer. So, that leaves me feeling great about it, but it also brings a sense of responsibility, it makes me work harder, it makes me think about representing metal and to do the best possible things I can do as a singer, writer and performer all these years later. It’s kind of a mixed blessing, really. [Laughs] But, I do really respect it, it makes me feel good and I have a good time with it. ROB: Yeah. I think music needs to mutate and transform and stretch and flex. It’s important for every generation that comes along to kind of grow and develop. I think that the metal scene today is in great shape because of all its incredible diversity. The good thing about it is that the traditional elements and the roots of metal, whether it comes from the greatness of Black Sabbath, or the continuation of bands like Priest and Maiden and right up to the current scene. I like Slipknot, System of a Down and whatever Tool is doing. I like Rage Against the Machine, POD, Staind. It all has it’s roots in the great beginnings of metal, and so I like that. Then you got Goth, Black and Death Metal and it branches off all over the place and I welcome it, I think it’s wonderful. Metal music is in a wonderful state right now. KNAC.COM: Would you ever or do you ever plan to throw some rap or DJ scratches into your music? ROB: No. I think you just find the place where you do the best possible work. I’m a metal singer, you know. [Laughs] I can appreciate some of the rapping stars that are out there, but I’ll leave that stuff to the experts. I’m just happy to be a singer who can hold a note and that has this amazing gift that I use with my voice. I can do many, many things with my vocals, which I hope makes me an interesting and entertaining singer, so that’s my world and I’m just happy to be there doing what I do. KNAC.COM: Let’s talk about the new album, [The Crucible]… what can fans expect from this one? ROB: Well, It’s our second release, so it’s a very important statement that the band has to make with this one. It’s right off the back of Resurrection and I think it’s crucial that we show some depth and some growth and some development, and I think that’s exactly what Crucible is offering. At the core of it, it’s another great heavy metal record, but it definitely has it’s own identifying flavor and style and technique form all the players. I just think it’s a great follow-up. KNAC.COM: You really put a lot of hard work into this one… working 12-hour days, 7 days a week. ROB: Yeah, it’s a labor of love really… You just pour your heart and soul into each moment and that’s what every body in this band sets out to accomplish. We didn’t take any short cuts and we didn’t have any kind of formulated, cookie-cutter moments -- and that seems to be rampant in a lot of the music scene today. We just worked extremely hard to make great music happen in the studio. KNAC.COM: Some of the tracks on this album seem very deep, making real statements. ROB: Well, each of the songs on this album are carrying a statement within itself. See, with Resurrection, from a lyrical point of view, was me talking about my own internal things, but all the stuff on Crucible is the stuff that I’m reflecting on within the world around me as we speak, and God know the world is in a pretty brutal state today. You know, apart for all the wonderful things that happen, there [is] some real crisis going on. KNAC.COM: “Betrayal” is scheduled to be the first official release. Tell me a little bit about that song. ROB: That song is about facing consequences from the choices you make in life… because you have to live by the things that you do and say and where you go, and I think the essence of what I’m discussing is that it’s very easy to betray yourself. Will you end up in heaven or will you end up in hell? You know all the things that you’re going for… did you do the best you could of with it? It’s a reality check, really. But, I just love what the song does because that track has a lot of tradition. There are a lot of identifying moments where you know that it’s right out of the Halford world. But every track on this record is pretty much standing separate from the next one, yet collectively it’s really all cohesive and follows through. KNAC.COM: Yeah, and that’s why the album’s title Crucible works perfectly with this album. Because, it is like a metal melting pot melding all these different metal songs together into one great, solid structure. ROB: Well that’s what it means to me. I love that kind of metal angle to the title, because that is what a crucible is. It’s where you actually, physically create this living, breathing molten metal thing out of the metal fibers from around the world. But also, the other perception of crucible is a test. It’s looking at life and all of its challenges and all if it’s pain and pleasure. The title does have a double meaning… Crucible is a double meaning expression and that’s what I like about it… there’s more than one meaning in the title. KNAC.COM: On “Betrayal” you really belt out that falsetto. Your voice is still on point after all these years. How do you keep your vocal chords in shape? ROB: I don’t know what it is! [Laughs] I don’t really question it that much, because I don’t want to jinx myself. I’m just able to use all of these great techniques and style and approaches with the voice that I’ve always been able to do. Of course, as you get older and live longer in life, certain physical characteristics change and there are some things that I can’t do as well as I used to be able to do. I wish I was a guitar player so I could just change the strings, but I can’t [Laughs]. But, I’m just lucky that the bulk of it is still strong and powerful and enables me still show it off it many different ways from release to release. ROB: You like that song? ROB: What did it make you think of? KNAC.COM: It makes me think of a motherly figure or something like that. ROB: There ya go. That’s exactly what it is. That’s right, I wrote it for my Mom and I’m just so thrilled that it made it to the bonus track. Everybody’s warming [up] to that song -- they love it to death. It’s just a reconfirmation of what mothers are and what they do and the fact that they bring us into the world and all of that. It’s just a love song for mothers, and I think that anybody with a Mom can relate to it. It’s just a wonderful song and I think that in time it will get a lot of attention. KNAC.COM: Lyrically speaking, what is your greatest source of inspiration? ROB: Oh, it depends on the place that I’m at. I mean, like I mentioned earlier, Resurrection had a lot of personal expose about what makes me tick inside and so forth. A good lyric can come from many different sources; there are really no set rules. But, what I try and do as a writer, as a lyricist, is at least make sure that some how it all connects and it’s not all fractured and broken. With metal you can do an enormous amount of variety in your work. You can take very real, vital issues and kind of embellish them in a metal way and still convey a strong message. There are very few forms of music where you can write about these worldwide issues and get away with it without sounding too deep and somber and depressing. KNAC.COM: Have you seen Ozzy’s show on MTV yet? ROB: Oh God, I’m addicted to The Osbournes! It’s just the funniest thing, a real joy to watch, it’s so much fun and I love it to death. KNAC.COM: If approached by a network, would you ever consider doing a show like that in your home? ROB: I live a very quiet simple life down in San Diego. But, I dare say that if I was married and had kids it would be a different story all together. [Laughs] But, I just love that Osbourne’s show, I really think it’s just so funny and entertaining. The real irony of that show is that Ozzy is the sanest member of his family. He’s just this regular dad trying to hold it all together. He’s got this crazy wife and crazy kids and he’s just there with his head in his hands and like ‘Gimme strength to make it through another day.’ It’s so funny, I love it. KNAC.COM: Do you keep in touch with any of your old Judas Priest bandmates? ROB: Yeah, I do actually. I keep in touch with Ian [Hill] and Ken [Downing] more than anyone else. Me and Glenn [Tipton] still have some patching up to do, but Ken and Ian are just still very close. KNAC.COM: Is their any chance for a Judas Priest reunion? ROB: Oh, I don’t know. Like I said bazillion times, I can’t speak for the band because I’m not in the band anymore. But, just for the personal love of what I was a part of and the way it makes me feel and all the great CD’s that we made… If there was ever an opportunity to go and jam out a couple of tunes with them, I’d welcome it. But, beyond that, it’s out of my control.